My 9-year-old son is a whiz at math. I wasn't sure though, how he'd do adding decimals. I thought I'd make it a little bit easier. Sometimes seeing and doing is understanding. A simple 10x10 grid makes a wonderful visual model. I made 10 grids with some of the squares filled in, and two grids without. Download them free from Google Drive here. I printed the eight with colored blocks on heavyweight cardstock and cut them apart. Next, I laid a piece of acetate (an overhead projection transparent plastic sheet) over the top and with a ruler and fine-tip Sharpie marker, drew the grid. Then I turned the paper over and laid it on top of one of the colored grids. I put the other colored grids underneath the first and tucked them all under the clip on a small clipboard. With the addition of some fine-tip dry-erase markers, I was ready to teach my son to add decimals. 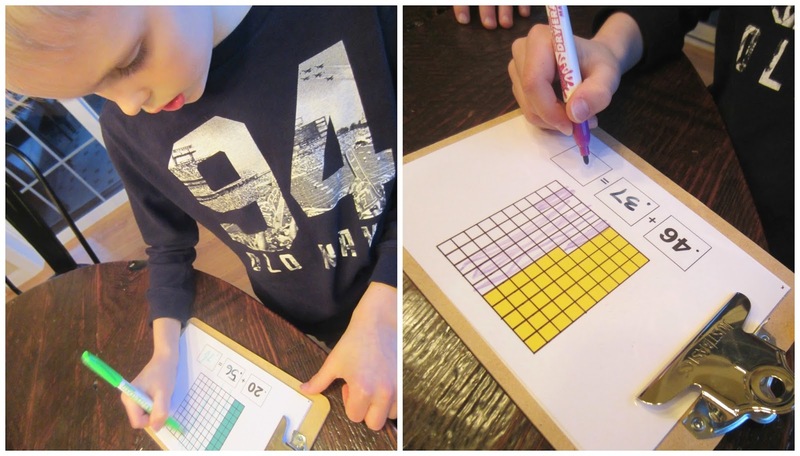 When my son came home from school, I added a second number with dry-erase ink to the acetate page to complete the math problem. 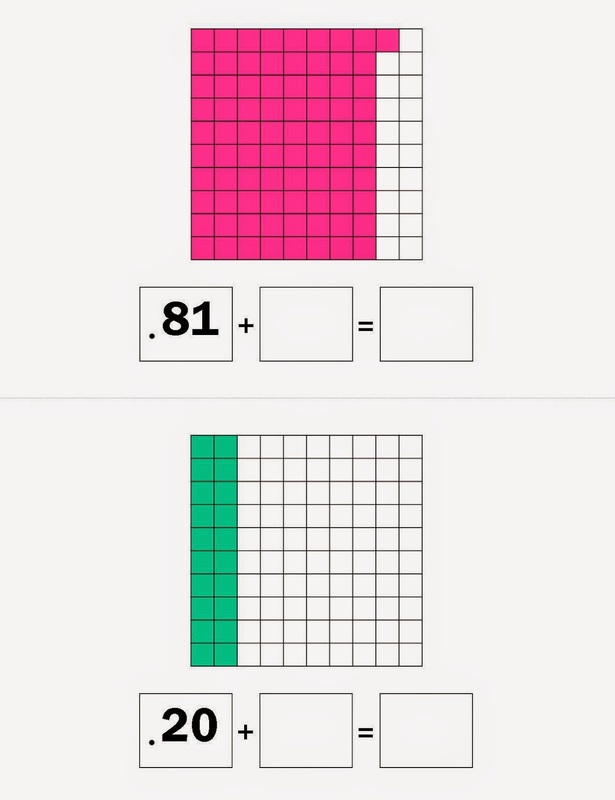 My son then colored the white squares to represent the second decimal number and looked at the total number of colored squares, writing the answer in the blank rectangle to finish the equation. This really clicked with my son and after four problems, he didn't need the visual model. Don't have an acetate sheet? No sweat! Either laminate the cards (blank or colored) or place them inside a clear glossy plastic sheet protector. 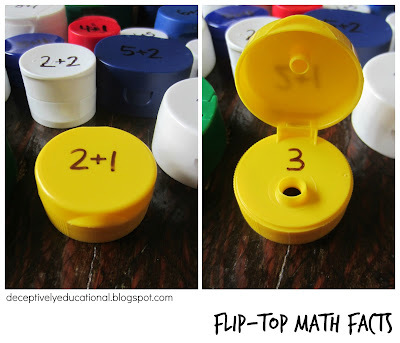 Both work with dry-erase markers. 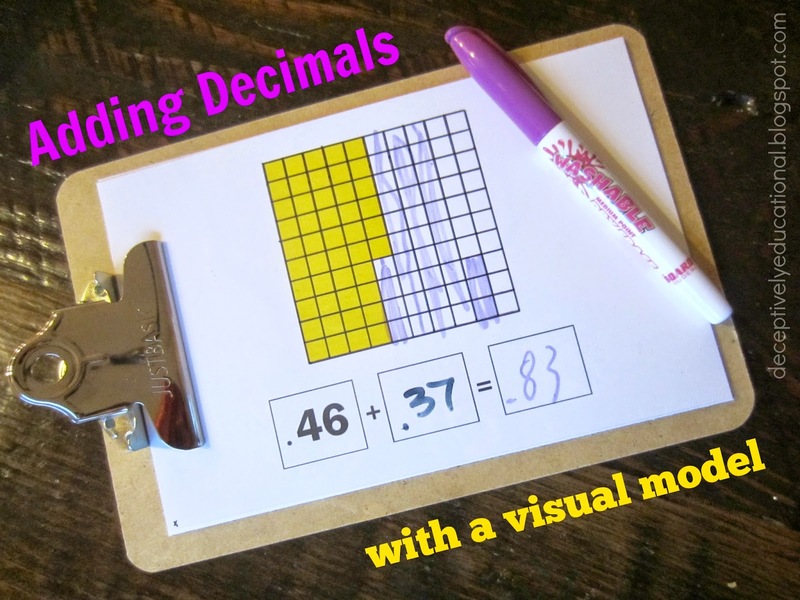 This great idea was inspired by the visual models in the book Dazzling Decimals. Check it out! Love this. We will be getting out the graph paper and colored pencils.